This is 2 on 2 game played in tight quarters. It is actually a great game for working on defensive coverage in front of your own net. 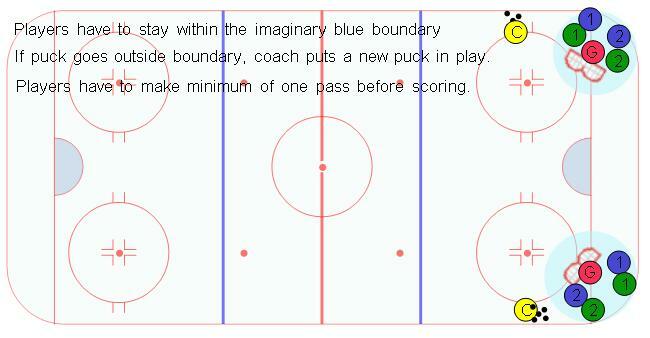 The only rules are that players must stay within the boundaries which are approximately shown in the diagrams and there must be at least one pass made between teamates before scoring. The puck is in play until the puck exits the boundary or is in the net. Both teams are trying to score. Teach the players that when they are on defense their goal is to keep themselves between the offensive players and the net. On offense, creativity is the goal.